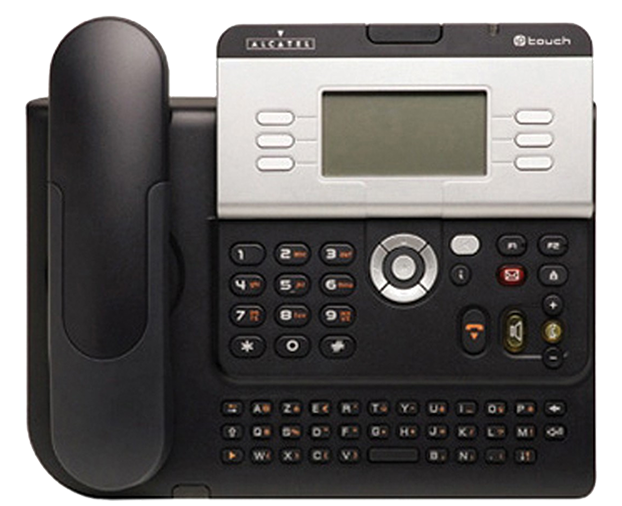 The Alcatel-Lucent 4028 phone is the executive model in the Alcatel 8 series IP range. Perfect for managers and everyday phone users alike looking for an easy to use and feature rich IP handset. For a full overview of the Alcatel 4028 phone please read below. The Alcatel 4028 phone is the mid level or executive model in the Alcatel 8 series IP phones. It's designed to work with the Alcatel Omni PCX phone system as well as the small business Alcatel Omni PCX Compact pbx. Aesthetically, and feature wise, it is very similar to the larger Alcatel 4038 phone. There are only a few minor differences: the screen is smaller, it only has 6 function keys versus 10 and the LCD display is black and white not 4 levels of grey. In terms of colour choice the Alcatel Luucent 4028 phone comes in both urban grey and arctic white options. The 4028 phone is undoubtedly the most popular IP phone Alcatel makes given its rich feature set and cheaper price point over the larger Alcatel 4038. Like many modern phones the 4028 phone is predominately screen driven. More traditional key system handsets have a larger number of buttons on the phone to see staff/ phone lines etc. Here everything is displayed on the medium sized screen and accessed by the 6 feature keys and 4 directional navigator in the middle of the phone. Even thought there are 6 buttons, the benefit of screen driven technology is that you can scroll down to see even more than you could on a tradition phone handset (40 programmable options in total). In the event that you need to see more than 40 staff you can attach extra DSS consoles to the side of the handset. They have another 40 buttons and you can connect up to 3 extra consoles to provide 120 buttons in total on the Alcatel 4028 phone. The only reason to get the 4038 phone is if you like to see more items instantaneously on the larger screen (10 per screen). Either way, you can program the order the 40 programmable features appear and customise it on a staff by staff basis to make their options more relevant for daily use. One of the best and most appreciated features of the Alcatel 4028 phone is the large QWERTY keyboard that sits at the base of the handset. This is a real bonus for staff that speed dial customers a lot and combine that with the Alcatel Omni PCX systems 3000 number capacity and it's a real productivity booster. Simply enter the name and all the correct options appear on screen. It's very fast and incredibly effective. The same keyboard also allows staff to send internal messaging if you wish to activate that feature. One of the best features of the 4028, and all Alcatel handsets for that matter, is the way the handset is laid out. All the most frequently used functions (hold, transfer, mute, speaker phone etc) have been colour coded. Also they are larger in size the more popular the function. It may sound strange but it's very smart and really does work well for users. If you're after phone for basic phone users, kitchens, retail shops, entry foyers etc then the very affordable Alcatel 4008 or Alcatel 4018 phone are the better choices and a great addition to your Alcatel Omni PCX phone system. They aren't screen driven or offer as many features as the 4028 phone but for basic IP phones they are excellent and budget priced. For staff that are used to traditional style key telephone handsets the Alcatel 4028 phone, and the entire premium Alcatel digital and IP handsets, are very different. This is both a pro as well as a con. With screen driven phones you can see much more however you have to scroll down the screen in order to do so. With traditional phones you simply had buttons with flashing LED lights and were then limited by the number of buttons on the specific model. The rub is that many people are used to using that type of technology and the Alcatel doesn't cater to it in these premium IP handsets. The basic 4018 and 4008 phone do but they only offer a total of 6 LED buttons. The Alcatel 4028 is a very good handset however you need to understand this key point of differentiation. Other manufacturers have addressed this customer disconnect by offering both types of options to customers. Another drawback of the 4028 is that the 6 soft keys are not LED. The active status of staff/ phone lines is displayed on screen. For users that are used to seeing flashing multi colour LED lights this may take a little getting used to. At least this is where the 40 button DSS console with LED status comes in very handy for reception staff. While these may be seen as shortcomings for some users they are seen as very positive by others. Like all IP handsets, the Alcatel 4028 phone connects to an Ethernet cable. When plugged it to a live port it will register automatically to the OMNI PCX system. This makes moves with IP handsets much easier than digital where the system needs to be reprogrammed. On the back of the 4028 handset is a 2nd Ethernet port so you can choose to run your computer thought the handset or have a separate Ethernet connection. The 4028 uses POE class 2 for power consumption. It's important to note that with the Alcatel Omni PCX phone system you can combine any combination of IP or digital Alcatel handsets. The IP models and digital models are physically identical, it is only the 10/100MB support that makes them different. In a normal office rollout you can save a lot of money by mixing and matching IP and digital handsets to cater to exactly what staff need. While there are numerous benefits in IP for the right company, the IP handset costs are always higher. For more info about digital handsets check out the Alcatel 4039, Alcatel 4029 or Alcatel 4019 models. The Alcatel 4028 phone comes with a 12-month Alcatel warranty as well as our exclusive free phone support for the life of your Alcatel Omni PCX phone system. Obviously the free phone support offer is only available to Infiniti customers. If you'd like to know more about the Alcatel Lucent 4028 handset and phone systems please call our friendly experts for more information and free pricing. Looking to learn more about Alcatel Lucent 4028 Phone Handset (IP Executive)?